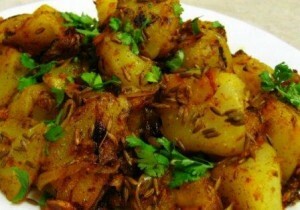 Chatpatey Aloo recipe by Sahar Affendy at DesiRecipes.com. first boil the potatoes cut them into samll square pcs. heat the oil in pan and add ginger & garlic paste,turmeric power,zeera ,red chillie powder,salt and stir it contantly.add potatoes in it it.then add lemon juice & coriander leaves .sprinkle chaat masala over it and serve hot. i med dis n it luks well rubish man! wat wste of mney innit!